In many occupations, working at heights is a significant and unavoidable part of the job. 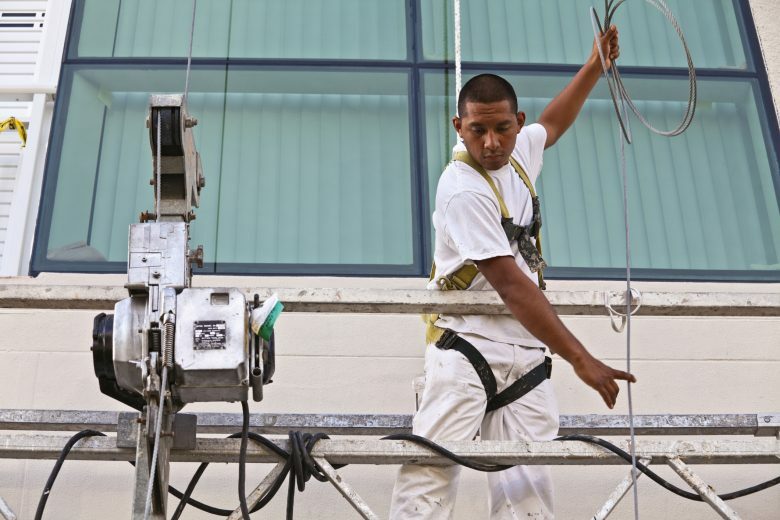 Although there are rules and safety regulations to prevent falls, every year many workers die or are injured after falling from ladders, scaffolds or other elevated areas. According to the US Census of Fatal Occupational Injuries, falls to a lower level accounted for 81 percent of all fatal falls in 2015, and more than two-fifths of fatal falls occurred from 15 feet or lower. In Canada, 42,000 workers are injured in fall incidents each year. There are several reasons for such a high number of injuries and fatalities caused by falls. One is the fact that many people undertake one-off jobs (painters, decorators, etc.) without proper training, planning or equipment. Another is a lack of compliance with the health and safety rules designed for working at heights. Human error also contributes to a large number of falls to a lower level, with complacency in particular, affecting employees who are experienced at working at heights. Given the seriousness of the issue, OSHA has outlined three straightforward ways to reduce fall-related injuries: plan, provide and train. By understanding and following these steps, EHS managers can help employees stay safe when they’re working off the ground. The first step that employers and workers can take to minimize the risk of falling from heights is to carry out a risk assessment. Conduct it thoroughly, discuss all the possible hazards that could be present at the worksite and talk about the steps that can and should be taken to avoid them. Among other things, this can help you select the right equipment for the job and take appropriate precautions to ensure everyone’s safety. For example, if a task involves power tools, determine the best power points, whether or not extension cords are necessary, how to avoid tripping hazards that might lead to a fall, and the safest way to store the tools by the work area so that they don’t get knocked off the ledge. Consider every hole in the floor, dangerous machines or equipment, slippery surfaces and debris on the floor and working areas. Even the weather can have an impact on your workers’ safety at heights so remember to plan accordingly. Ladders – Only acceptable for work of short duration and should be erected at a correct angle, secured and positioned close to the work to avoid overreaching. They should also be protected at the base to prevent pedestrians or vehicles bumping into them. Stepladders – Should always be spread to their full extent and locked. The top platform, the tool shelf or the rear part of the ladder should not be used as a step. The ladder must be the correct type for the work and should only be used by one person at a time. Guardrails – Required at the edges of construction sites, roofs and scaffoldings. Toe-boards – Around every elevated open-sided platform, floor or runway. Elevating work platforms/scissor lifts – Should only be used on level, firm ground and operated by trained staff in accordance with the written instructions of the manufacturer. Wind speeds should be considered when operating the platforms and the weight on the platform should never exceed the manufacturer’s load rating. Scaffolding – Should be erected by a competent person and never moved while the tower is occupied. It must also be regularly inspected and maintained. Scaffolding should be level and never overloaded. Safety nets – To be considered when no other means of protection are reasonably achievable. They should only be installed by trained staff, and be tested and inspected on a regular basis. Personal fall arrest system (PFAS) and hard hats – Each person must be provided with their own hard hat and harness. They have to fit and be regularly inspected for defects to ensure that they are still in good condition. It might also be a good idea to provide workers with safety devices that are not legally required but that can prevent injuries and save lives. For example, the problem of falling tools causing damage, injuries and even fatalities can be prevented by things like tool lanyards and topped containers. Look into additional equipment and devices that can make your workplace safer, even if you’re not required to do so. Workers need to be trained thoroughly (and in a language they can understand) about job hazards. They have to be taught the proper setup of their equipment and the importance of using it correctly. The training should encourage workers to use safe practices as their first and most important responsibility. People working at heights must be trained in practical fall prevention and fall arrest techniques. In addition, the employer needs to ensure that workers know everything there is to know about the selection, maintenance and use of any gear and equipment that they will be using. It is the employer’s responsibility to provide the training and the equipment as well as ensure that workers use it correctly. Avoiding falls prevents fatalities and injuries and saves money. But the issue must be taken seriously by both employers and the employees. Planning for the day’s job, having the right equipment, and knowing how to use it can greatly contribute to making workers at heights (and those below) safer. Can Visuals Unlock More Engaging Safety Training?